Denna produkt ger dig 1088 bonuspoäng. 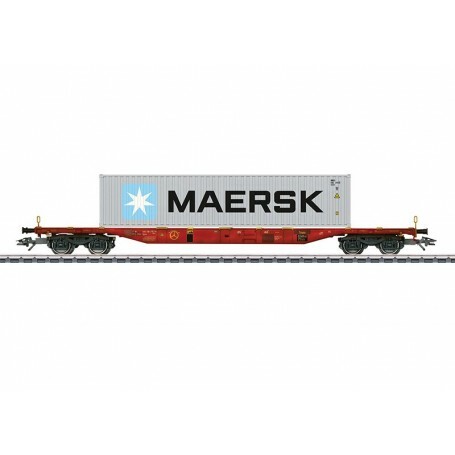 Containervagn Sgnss 'Maersk', längd över buffertar 22,7 cm, epok VI. Model: The car has type Y 25 trucks. The prototypically partially open flat car floor is constructed of metal with striking fish belly style side sills. The car has a hand wheel for setting brakes from the car floor. The car is loaded with a removable 40-foot box container. Length over the buffers 22.7 cm / 8-15/16'. DC wheel set E700580. Prototype: Type Sgnss four-axle container transport car for combined load service. Privately owned car painted and lettered for the firm Touax, registered in Germany. Loaded with a 40-foot box container. The car looks as it did around 2014. Modern electric freight locomotives to go with this car are the classes 185, 189, or 193 that can be found in the Märklin H0 assortment.